Moutier, a French-speaking Swiss town of around 7,000 people, has voted to leave the canton of Bern and become part of the canton of Jura. Last Sunday, 51.7% of the nearly 90% of voters casting a ballot, voted to leave Bern and join Jura. Moutier is a commune in one of four districts that decided to remain part of Bern, a largely German-speaking canton, rather than join Jura, a French-speaking canton created in 1979. In 2010, three of these four districts, one of which contains the commune of Moutier, joined together to become the Bernese Jura, an administrative region of Bern. 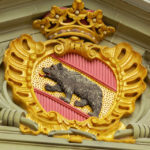 The other, German-speaking, largely-Catholic Laufen, left Bern and joined the largely protestant canton of Basel-Landschaft in 1994. Before this it had been an island of Bern surrounded by the cantons of Solothurn, Jura and Basel-Landschaft. Sunday’s vote was Moutier’s fifth on its choice of canton. Some past votes had been so close that the federal government sent in vote observers. In Switzerland, changing canton is a big deal involving changes in tax rates, health and education systems, along with many other things affecting everyday life. Sunday’s vote was a peaceful affair, however it hasn’t always been so. In 1974, the question of separation was put to the jurassien people in a referendum. 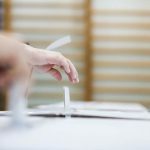 The vote saw 52% of jurassiens vote in favour of breaking away, but with only three out of the Jura region’s seven districts delivering a majority in favour. The town of Moutier was in a district that voted against the plan, meaning it wouldn’t become part of the new canton. In 1977, separatists, unhappy with the 1974 result, clashed with police on the town’s streets. 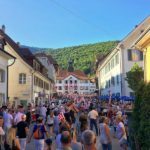 Despite sharing a language with the French-speaking Jurassien population, a majority of the population in the Bernese Jura follow a different faith – Protestantism rather than Catholicism. 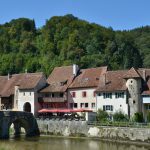 However, the smaller commune or town of Moutier, not to be confused with the larger Moutier district, has more Catholics than Protestants. A 2008 survey put the percentages at 45% and 32%. It can be seen in pink, surrounded by green, on the map below. Religion was only one aspect of a complicated referendum decision. For example some feared Moutier would lose its hospital if it joined Jura, given the nearest Jurassien one is only 10 km away in Delémont. There were also numerous economic and social aspects associated with the decision. Moutier’s process of switching cantons will take until 1 January 2021, leaving plenty of time for the 1,930 who voted “no” to discuss their differences with the 2,067 who voted “yes”.